I've lamented about all my stuff and feeling like I'm being buried in it, yet I still consume consume consume. If I see a craft project that I wanna get my hands on, I can't resist getting it. I'm not much of a mall shopper, but even aside from crafting stuff, I catch myself wanting a lot more stuff than I could ever need. I stumbled on this video from someone else's blog. I never know exactly how I get from one place to another when I'm blog hopping. But if you've lamented about stuff, you might be interested in watching this. Warning: It's long, 20 minutes. But I thought it worthwhile mentioning in case anyone felt like watching. Click on image to watch. The irony of this film is our need/want to spend has been halted due to the economy and not to the environment, etc. Everything is cyclical. At our heightened need to make change we are "doing our part" but for a different reason. -Our country simply can't afford it. Wow. Just wow. I will be posting a link to this too. I think about this stuff, but not enough and I don't ACT on it enough. My husband is even worse though. He is such a consumer. He recently rented a studio to work in and I thought, "Great! We'll have so much less STUFF in the house when he moves his equipment and stuff over." I can't tell a difference, honestly. I'm trying to wade through the office to set up a crafting station and feel defeated. By stuff. Ugh. One stuff word comes to my mind sadly....books. Steve calls his stuff....inventory. I've been decluttering a house full of "stuff". I haven't actually thrown anything out yet, but it's being sorted into different categories. There's "stuff" that really belongs to the boys, and will eventually be delivered to their houses whether they like it or not, "stuff" to be given to the second hand Care and Share shop, "stuff" to be boxed ready for the giant summer yard sale, and "stuff" that I need to keep. Unfortunately the second category seems to be the biggest! But at least I don't need to buy any more "stuff", I've already got plenty. Yeh stuff is stuff,i too have too much stuff. I am glad that Ivey got adopted but yes it is hard, i have another couple coming tomorrow to see the others.It will be a week since they all got fixed and chipped. I know what you mean about being sensitive. 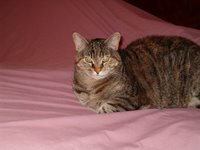 Right now we are going through that with our oldest cat TC she is in kidney failure so far so good she is still eating. Hubby is not ready to let go of her yet so doing all we can to make her comfortable.Vet said as long as she is still eating she will be fine for now. They have filled her with fluids and need more, so will probably be doing that on my own as it is really getting expensive to do that. Anyway say a little prayer for her.